Amsterdam welcomed the Iran Boat in Amsterdam Canal Pride Parade 2018 with open arms. Non-stop applauses, smiles, warm wishes from people was strong enough to give us hope to continue fighting for Queer Rights in Iran and Persian-speaking communities. But in Addition, it was an amazing surprise to be embraced by the whole Netherlands as the best participant of Pride 2018. We are honored that the land of freedom chose the Iran Boat over 79 fabulous boats. It’s an strong message to us that we are not alone in the fight for our cause. 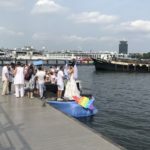 The Iran Boat has won the award for the best participant in Amsterdam Pride. From the boxed [where boats where waiting for their turn], you could hear people who sings with loud Persian music. Door de boxen klinkt Perzische muziek er wordt luid meegezongen.